Important Note: The information on this page addresses only steel used by Absolute Steel as compared to other American made steel. Foreign steel (Mexican and Chinese) is far inferior to what is described below and it is being used by some tubular steel building manufacturers. We cannot emphasis enough about the importance of using quality structural steel when it comes to the construction of your Texas metal building or carport system. Absolute Steel uses only American made steel in its tubular steel structures and for good reason. Think of corrosion to steel like you would termites to wood. The steel we use has a G90 galvanized coating, the competition uses a G60. That’s one third more in zinc coating protection from corrosion. Our steel has a patented protective coating on the outside which further prevents corrosion from occurring. 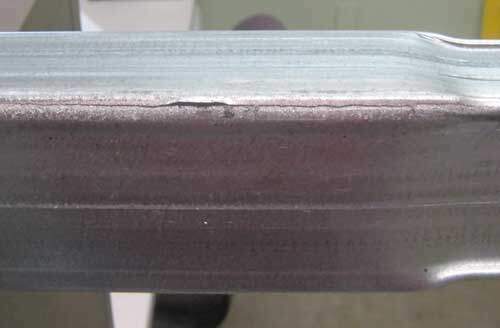 Salt spray tests show that after 312 hours of continual exposure to water and salt that regular US made steel shows 100% white rust and 10% red rust. Our steel shows 20% white rust after 840 hours of this kind of exposure. 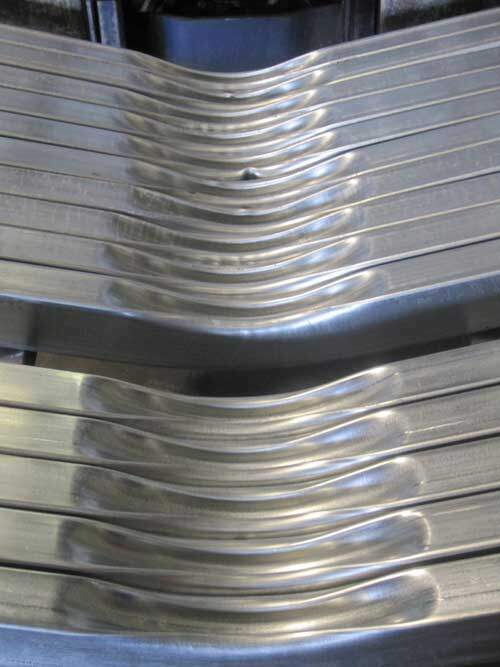 Our steel has a patented protective coating on the outside which further prevents corrosion from occurring. 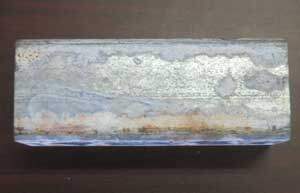 Salt spray tests show that after 312 hours of continual exposure to water and salt that regular US made steel shows 100% white rust and 10% red rust. That’s nearly three times the corrosion resistance! Obviously the strength of the steel used in metal buildings is important. For our Texas steel buildings we use only steel that has minimum yield strength of 65,000 psi. That’s 30% stronger than the American made tube steel specifications for engineered metal buildings. That means it has increased structural rigidity, a greater load carrying capacity and is more impact resistant than the competition’s. The 2″ x 3″ steel tube we use in all our Texas metal buildings is nearly twice as strong as the competitor’s steel you see offered by those roadside vendors. Absolute Steel 2″ x 3″ steel tube used in our main frame system (and we go larger from there) has a beam load of 2,150 lbs. Steel tube 2 1/4″ x 2 1/4″ used by the roadside vendors in their main frame system has a beam load of 1,101 lbs. There is no substitute for quality. At Absolute Steel, we work with steel every day. If you fabricate steel that has inconsistent properties or characteristics, you will be driven stark raving mad. 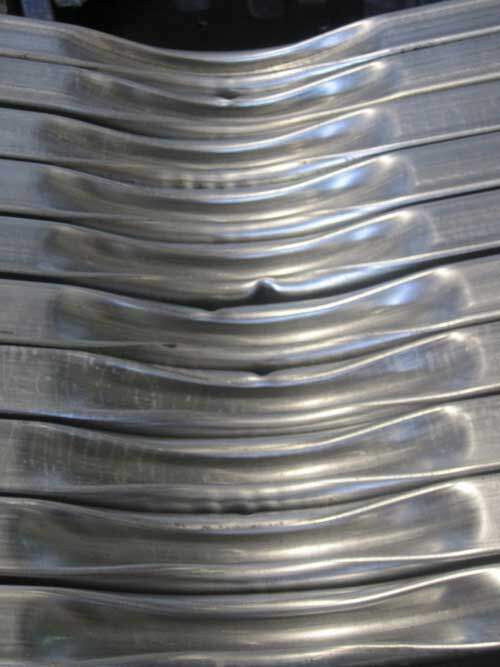 Some of it won’t take a weld or it has weak spots. (Too much carbon/not enough carbon.) One part of it can be fine and then when another section of it undergoes a fabrication process, the inconsistencies surface and you realize man hours were wasted trying to save a buck or two. This is a steel tube with weakened seam weld. Notice the split at the corner seam. Notice the inconsistent tube characteristics. This will make building construction a nightmare! 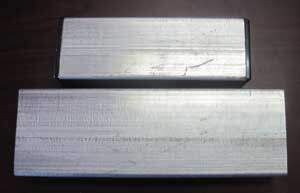 Above: Absolute Steel is shown at the bottom of the image. Note the consistent, even steel qualities. The competitors’ steel is at the top of the image. With superior steel, we produce at a faster rate and you get a better product! The quality of steel used in our Texas metal buildings and steel carport systems is one important reason why our structures have been chosen by all branches of the US Armed Forces and for such unique environments as inside the salt mines of Cargill where moisture and salt are present 24 hours a day.